All-pink picnics, mansions, cruises, and a million other ways to enjoy #roséallday is what excited us most about the opportunity to partner with Sopexa USA to come up with a memorable, stand-out dinner concept to showcase an array of rosé wines from Provence. 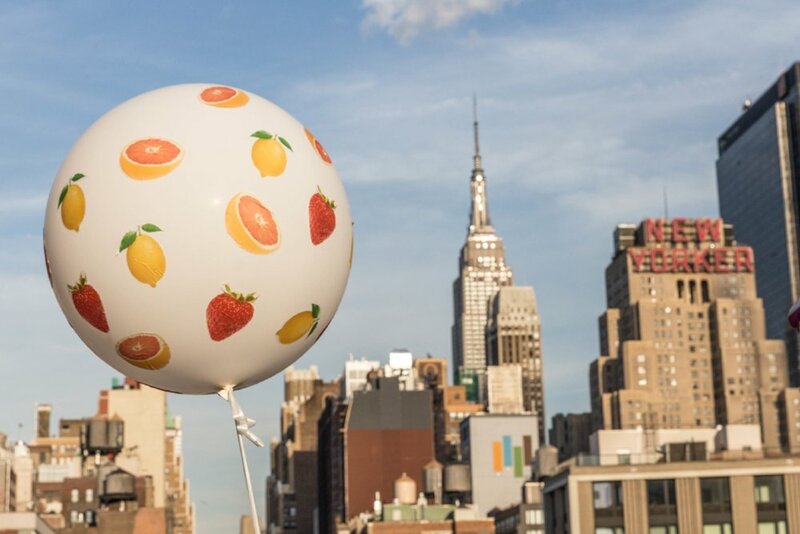 We love a creativity challenge, and if there's a market that's hit peak saturation, it's parties and promotions around rosé wine. Having recently been introduced to a talented New York chef whose unique niche is "perfume dinners" we loved the idea of conveying Provence through one of the least celebrated senses: scent. A distinct smell can create such a strong sense of place. We connected with chef Tessa Liebman, who through her Methods + Madness dinners has long strived to incorporate smells into the dining experience. Adding acclaimed sommelier Arthur Hon to the dream team, we got started identifying the key scents of Provence we'd highlight for guests. Grapefruits, strawberries, lemons, peaches, apricots, white nectarines. 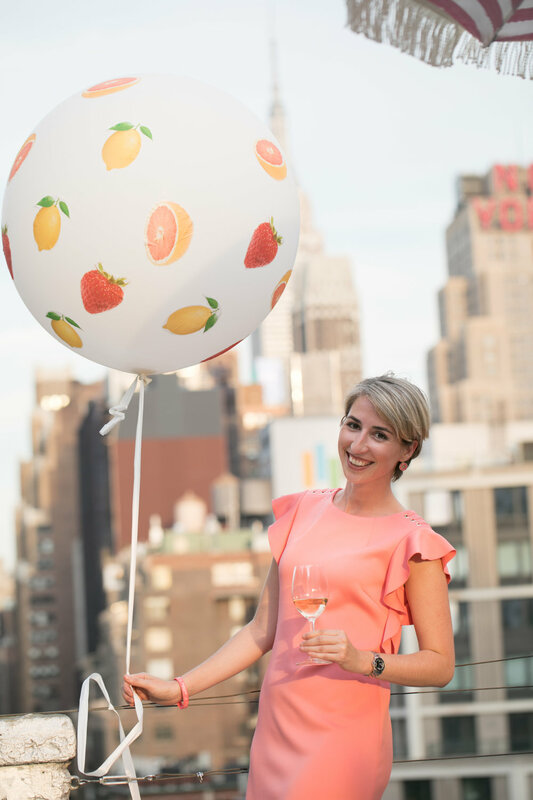 Beginning on the rooftop of the residential building near Hudson Yards in Manhattan, guests met Arthur and the president of the Provence wine board and learned more about our concept for the night. Arthur suggested they tap into some of the senses they might not usually favor for a dinner: sight, touch, and of course, smell. Citrus and stone fruits were displayed for this purpose, and Chef Tessa started them off with a Study of Strawberries, presenting the berries three ways: unripe, fermented, and charred. On our way downstairs to the loft, the sounds of cicadas from Provence serenaded us. At our Florals station, flowers were arranged in an ombre from the palest pink to dark fuschia, and a frame displayed Pantone chips of the Provence-recognized shades of rosé. Guests were handed bottles loaded with floral scented cotton puffs, from Gardenia and Tuberose to Violet and Lilac. We all learned how to pronounce "pissaladiere," a traditional French baked good, that Chef Tessa served with lavender roasted green olives and lilac vinegar. Guests made their way to the table to experience the more savory side of Provence, where we combined herbal and saline scents and tastes into a table set with fresh herbs and river rocks, as well as incorporating both into the next two courses. Olive branch garlands, potted rosemary, thyme, and sage plants adorned the mint green and charcoal table setting, supporting our thesis that not all that celebrates rosé must be pink. We served fresh radishes and tarragon butter and an Herbes de Provence chicken brochette to exemplify herbs while salinity was represented by Chef Tessa's creative seafood bouillabaisse served with hot river stones. The final stop was for dessert. Spices like nutmeg, vanilla, black pepper, and badiane (French for star anise) were represented by a brilliant macaron created by Chef Tessa, with eggplant buttercream. A smoky presentation of a spiced chocolate truffle closed out the menu. We don't want to neglect to mention the gorgeous wines paired with all these experiences. The evening's sommelier, Arthur Hon, paired nine wines to each station and scent profile, providing careful descriptions of each, and tons of great information about the Provence region, how rosé there is made, and what makes it so remarkable. Please get in touch with us if you have a private event you want executed creatively, professionally, and in a beautiful residential space!